This is the official CircleMe blog where you can catch up with CircleMe's latest releases, announcements and other articles about CircleMe. To make the pasta use 6 cups all-purpose flour, 6 eggs, 3/4 cup water, and 2 teaspoons olive oil. 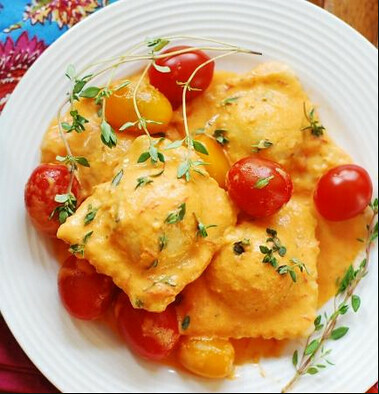 For the sauce use 1 can crushed tomatoes, 1 cup tomato puree, 1/2 cup grated Parmesan cheese, 1/3 cup water, 1/3 cup tomato paste, 3 tablespoons sugar, 2 tablespoons minced basil, 1 tablespoon minced parsley, 1 tablespoon minced oregano, 1 garlic clove, minced, salt, and 1/4 teaspoon pepper. For the filling use 1 carton of ricotta cheese, 2 cups shredded mozzarella cheese, 1/3 cup grated Parmesan cheese, 1 egg, lightly beaten, 2 teaspoons minced basil, 1 teaspoon minced parsley, 1 teaspoon minced oregano, 1/4 teaspoon garlic powder, salt and pepper. Place flour in a large bowl, make a well in the center and add beaten eggs, water and oil. Stir to form a ball. Turn onto a floured surface and knead until smooth and elastic. Cover and let rest for 30 minutes. In a pot combine the sauce ingredients. Bring to a boil. Lower heat and cover and simmer for 1 hour, stirring occasionally. In a bowl, combine the filling ingredients and refrigerate until ready for use. Divide pasta dough into fourths, place teaspoonfuls of filling 1 inch apart over half of pasta sheet. Brush around filling with water, ffold sheet and press down to seal. Cut into squares with a pastry wheel. Boil salted water and add ravioli. Simmer and cook until ravioli float to the top and are tender. Drain. Cover with sauce and serve.